2nd Alakajam! | Announcements | Alakajam! We have had an awesome 2nd Alakajam! We want to shout out a big "Thank you" to everyone who made this jam that great, being it submitting/rating theme suggestions, creating games, rating games and giving valuable feedback. You are awesome! 71 Games were created during a very limited time and that alone is a great achievement. So congratulations to all solo or team devs who took part! But of course Alakajam wouldn't be Alakajam without ratings and winners. So let's crown our winners! We hope you had a lot of fun, learned some new skills or found some new friends. As we try to make the event even more pleasing to you, we would also like to ask you for your feedback in this 2 minute survey. Of course we have the next jams ready for you. Mark your calendars! The wan and only, who started Alakajam and keeps it running! Technical Managers: Aurel300, eldy, thomastc (recently active developers), but also thrainsa, toasty, rnlf, dollarone and more! Also, thanks to all the streamers, youtubers and speedrunners who covered the event! We hope to see you all for the next event! 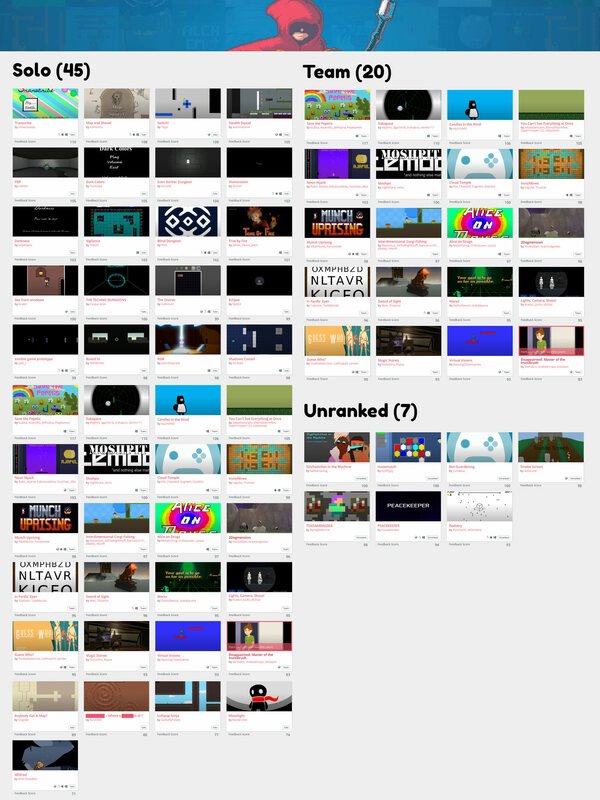 A total of 71 amazing games were created for the 2nd Alakajam. You have until Sunday, Mar 11th to rate the games. Please do so, to ensure that all games get a final score. The game view has switched to rescue mode (displaying the entries which desperately need some ratings) to ensure that all of the games get a final score. Congratulations to everyone who took part in this event! You have (solo or team, ranked or unranked) created a game in a very short timeframe! That is a good reason to tap your shoulder and get a big smile to your face! The 2nd Alakajam is now complete with over 72 games! The next step is the voting phase. Go to the games listing and play (and vote on) those awesome games. The creators are definitely also interested in some feedback, so if you have the time, write them some lines what you like, what could be improved and where you would have taken this game. The voting phase runs for two weeks until 11th March. This is also the date where the winners will be announced. Congratulations everyone for joining the jam :) We have beaten the record of the first event, with already 69 games to play! Submissions are still open for unranked submissions: while those won't be officially ranked, they can expect as many people to play & comment on them. So, if you haven't finished your game in time, it's not too late to complete something! Game submissions will completely close Monday at 10pm UTC. We will post more details about the voting phase tomorrow evening, but you can already go play & review games right now! After 48 hours the 2nd Alakajam has ended (for ranked submissions). Stop writing code, painting graphics or composing music now. Starting from now, you have one hour left for submitting your game. If you haven't done so, you can do this here. Around 8pm UTC submissions will finally be closed for ranked entries. Unranked entries have 24 hours extra, but for them there will be no submssion hour. Rating starts directly after the submissions are closed and will stay open until Mar 11th. I like the wooshing sounds deadlines make when they pass by. The time to work on your game ends tonight at 7pm UTC for ranked entries. After that time, stop adding features to your game. However, as we know that the final hours of a jam can be quite stressfull, you have one additional "submission hour". So the submission of ranked entries is possible until 8pm UTC. At this point, solo and team submissions will be locked. As literally everybody is trying to submit in that timeframe, traffic issues might occur. Voting will start right after the submission hour, so if you are looking forward to play some games, you can do so right away. Unranked jammers have additional 24 hours ( + submission hour) so for them the doors close on Feb 26th at 10pm UTC. We hope everyone is doing great and has a good time working on their games. Whether you got some sleep or pulled an all-nighter or started late, we are not 12 hours in. Everyone would like to see some progress on other peoples games and hereby we announce a call for blog-posts! Just click here to do so. Where are you taking the theme? Which tools do you use? solo or team? And everyone loves to see images or gifs of gameplay mechanics starting to come to live or beautiful glitches and funny bugs. Pictures of food, pets, memes also get a great share of love as well as sharing your progress on audio or soundeffcts! As it is saturday you should take advantage of #screenshotsaturday and post your progress also on Twitter #alakajam. If any question or issue with the site or jam arises, do not hesitate to look for the support thread or as a question there in the comment section! The 2nd Alakajam has started! Let's make awesome games! We all enjoyed the awesome opening ceremony created by Aurel300 and DanaePlays . If you missed it, you can still find it at Danae's Twitch channel. And the theme is "YOU CAN'T SEE EVERYTHING"
Playing a game of hide and seek is a lot of fun, not only to kids. There are video games also relying on this: Invisigun Heros. Write a blog post: Share your thoughts on the theme, post your progress, images of food or gifs of cute animals. gl hf to all of you and see you on the other side! The 2nd Alakajam will start in just half a week and preparations are coming together nicely! Up until now the jam already got quite some attention for theme submission and voting, on Twitter, reddit and a whole bunch of "I am in posts" here on the website! The 2nd Alakajam will start on Friday, Feb 23rd 7pm UTC. @Wan and @Aurel300 are frantically working on an opening ceremony hosted by Aurel300 and DanaePlays, which will take place at Danae's twitch Channel at 6:30pm. Starting with the lowest ranked themes of the shortlist, themes will be discarded out one after another until the final theme will be announced at 7pm. If you have not yet voted on the theme shortlist, do so now. Write an "I am in post" here on the blog to introduce yourself or your team.